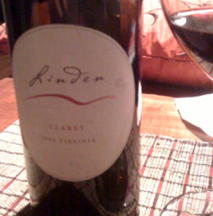 Linden without a doubt, in my mind, one of the top producers of wine in the state. Their wines are consistently good across the board and their prices really match with the quality of the wine you are getting. Today I am writing about their 2004 Claret, a blend of 48% Cabernet Sauvignon, 35% Petit Verdot, 13% Merlot, and 4% Cabernet Franc. The Claret is offered on Lindens regular tasting room list that is offered for free, and the last time we were there we got to taste the 2004 and 2005 side by side. If you really want to get into the meat of what Linden offers make sure to check out their reserve tasting that is only offered on the weekends. Jim Law the winemaker does a great job of providing info on his wines via their webpage so below is all about this Claret. Vineyards: Hardscrabble Vineyard (59%), Fauquier Co. on top of the Blue Ridge at 1,300 to 1,400 feet with an eastern to southern slope. Deep, well-drained mineral soils give cherry character and good structure. Vine ages from 12 to 19 years. Avenius Vineyard (20%), Warren Co. is just 1 mile north of Linden Vineyards at 1,300 feet contributes good acidity and verve. Vine age is 7 years. Boisseau Vineyard (4%), Warren Co. is located on a bluff above Front Royal in the Shenandoah Valley at an elevation of 600 feet. The vineyard is west facing on light, deep, well drained loam soils. The vines were planted in 2000 and are trained on cordon/VSP trellising.Vintage: 2004 can best be categorized as a roller coaster vintage. The growing season was quite good, with a very early flowering due to a hot May, below normal summer temperatures, and a slightly higher than normal rainfall. Mid August through early September was a beautiful window of perfect ripening weather. Low crop levels combined with an early flowering resulted in a very early start of the harvest under ideal conditions. Mid-September was problematic with a series of rains from hurricanes that brought some dilution and berry splitting. Late September through mid October gave us beautiful sunny, dry weather. The reds were able to take advantage of this. There was much fruit desiccation because of splitting and botrytis from the hurricanes, but this seemed only to concentrate, in a good way, as there was no sour rot or off flavors. The vintage reminds us of 1999, which produced wines with silky tannins, generous fruit and medium body. Harvest for Claret was from October 7 to October 20, 2004. Winemaking: Double sorting, native yeast, warm fermentation and early pressing give the wine its pretty aromatics and supple texture. Aged in older French, American and Hungarian oak for 22 months. Great and ready to drink now, but still has some legs on it to run for a couple more years. At $20 I think it is a great value, and reminds me of some of the early release 2005 Bordeaux wines that I have tasted so far. You can purchase Linden wines from their website or from the winery as well as various wine retailers across the state. Don’t forget October is Virginia Wine Month, so now is as good a time as any to get out and enjoy the beautiful fall weather and visit some new wineries or old favorites.